The Next Jodie? | personal.amy-wong.com - A Blog by Amy Wong. Now, I heart Ellen Page… Junoness, and Hard Candy. LOVE. But the next Jodie Foster? Not sure… my dad certainly could agreed on that. He told me so, isn’t that cool? Does any of you get to discuss Ellen Page’s Junoness and Hard Candy’s acting ability with your parents? Evan Rachel Wood, I was the biggest ERW fan pre-Thirteen, during the Once & Again era (Pre-Mischa Barton Kiss, people), and I was fanatical during Thirteen, but haven’t really been wowed again by Wood’s projects. Sure, Down in the Valley was average, as was Running with Scissors. I even enjoyed King of California and Across the Universe. I’m sure keeping an eye… but just a watching eye. And the Marilyn Manson thing? Ew. Abigail Breslin. LOVE. Striptease in Little Miss Sunshine, anyone? *snort* Signs, Raising Helen, No Reservation… I’m thinking she’s more into the light drama, comedy type of films. Not Jodie, maybe Drew Barrymore (sans drugs and alcohol *crosses fingers & knocks on wood*) or Reese Witherspoon? Saoirse Ronan. One of the best parts of Atonement for me. I mean, forget Keira… we wanted MORE Saoirse in there. Sadly, I’ve only seen one of her performances (and I’m even too lazy to check if she’s got any other projects prior Atonement). So, no comments. 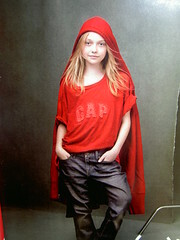 Dakota Fanning, she is kid acting royalty for me. LOL’ I’ve never LOVED her characters, but I’ve always been wowed by her. I Am Sam, left me open-mouthed because she was so little and so grown up. I certainly forgot she was a kid, and saw her as an actress since. Man on Fire, even not-so-good Hide & Seek… crazy acting that girl. And how about that nutz over one of her latest projects? Me wants to see that film. With indecision with the next 3 spots, LOL’ Undecided between choosing Ellen Page, and Evan Rachel Wood over Danielle Panabaker and Shareeka Epps. Maybe like this… 3. Ellen Page, 4. Evan Rachel Wood, 5. Shareeka Epps. 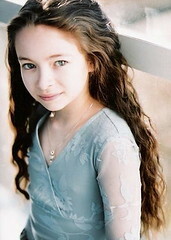 She was born in 1994, and debuted on the screen on 1999. She might be most recognized for her role of Sharon/Alessa in Silent Hill. She was amazing on Tideland. One response to The Next Jodie? When You Think ‘Child Actor’ – Who Do You Think Of? Chloe Moretz’s Hit Girl is my New Hero-ine.